Yesterday, daily oil prices were propelled higher once again primarily as a result of continued and chronic dollar weakness which saw oil prices break and hold above the $74 per barrel level which is now approaching the key technical level of $74.50. Having breached the original resistance at $72.50 we now need to wait for this secondary move higher to be confirmed and provided we see daily oil prices hold above the $75 per barrel level then we can assume the breakout is complete and we should therefore see a sustained trend develop in the next few weeks. The 9 day moving average has now firmly crossed the 40 day moving average adding further weight to the bullish sentiment and with all three moving averages now turning higher these should provide good technical support for daily oil prices in the near term. Just to remind that the DOE weekly stats are delayed by one day owing to Monday’s Columbus Day Holiday. Overall the WTI oil contract closed the oil trading session at $74.15 having opened at $73.17 and traded between a high of $74.55 and low of $72.83. 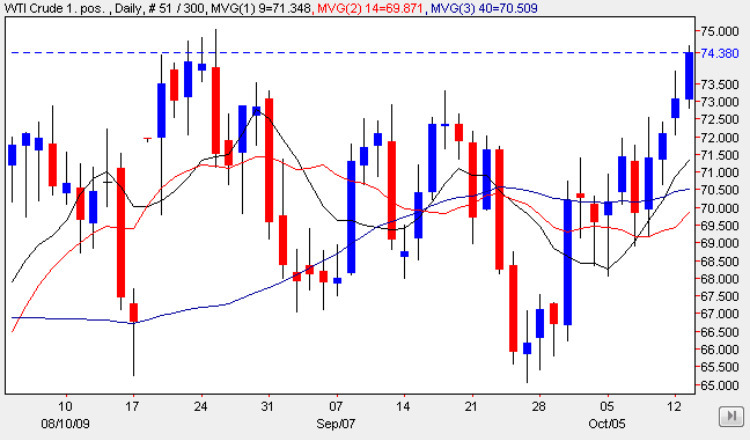 The Brent contract closed at $72.40 having opened at $71.13 and traded between a high of $72.83 and low of $70.84. Oil futures contracts traded were just under 317k & 116k respectively. Trading oil futures is difficult at the best of times which is why it is so important to use an oil broker who can offer the widest possible oil market experience, tight spreads and low margins. In addition the best oil brokers will also offer an outstanding trading platform such as the metatrader4, one of the most respected and trusted retail platforms. For more information and to download an online oil trading account click any of the highlighted links. Good luck and good trading.